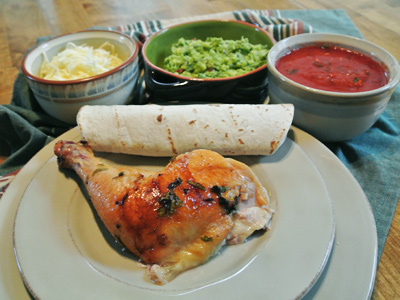 Tortillas are a staple in our home, we eat them with practically everything. They are used as an edible bowl disguised as tacos, a spoon for sopping up chile, an edible wrap when we are craving a sandwich and my personal favorite, toasted on a comal and then slathered with butter and drizzled with honey. Homemade tortillas taste so good when made fresh but honestly they will last awhile and warm up nicely in the microwave or toasted on a comal or cast iron griddle. My only problem in making them was keeping up as I prepared the individual rolls into balls and then rolling them out before toasting. Good thing I had a helper handy. Joe came in and saved the day, running the individual balls of dough through the tortilla press and then passing them off to me to roll out a bit thinner so that they would toast up soft and fluffy. In no time we had a stack of tortillas ready to be devoured! It’s chile season in New Mexico and beyond. One of the things I miss most about living in New Mexico is the smell of roasting green chile in the air. There is nothing like it! But in the last few years Hatch chile has come to me. Several years ago I found a grocery store across town that was roasting NM Hatch green chile and I filled my freezer full. In the last 2 – 3 years it has expanded and now we find chile across the Kansas City metro with roasters going at many grocery stores on any given Saturday in August and early September. I love this time of year and always save out the biggest and meatiest of chiles for rellenos. Making rellenos is a labor of love but it’s a messy tradition. These chile relleno chimichangas have a crunchy outer texture like a traditional relleno but it makes less mess without the batter. This is my second batch of chimi’s since we got our green chile. I’ve had green chile every day for a week now, for instance we’ve had green chile cheese burgers, green chile stew, quesadillas, breakfast burritos. I could go on and on! !